Ansah hasn't played a full 16 games since the 2015 season. 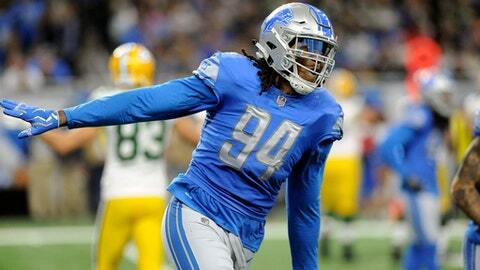 ALLEN PARK, Mich. (AP) — Ziggy Ansah is back from the PUP list — and has little to say about his contract situation. The Lions removed the defensive end from the active/physically unable to perform list Monday, and he spoke to reporters for a bit. But Ansah didn’t shed much light on how negotiations went with the team. Detroit ended up bringing him back this season on the franchise tag . The Lions have not said what injury caused Ansah to go on the PUP list. He hasn’t played a full 16 games since the 2015 season. Ansah played in 14 games last season and finished with 12 sacks, including three each against the Giants, Bengals and Packers. Detroit drafted him in the first round in 2013. The Lions begin joint workouts in California on Tuesday with the Oakland Raiders. Ansah said it will be up to the coaches how much he does this week. Detroit plays its preseason opener at Oakland on Friday. Patricia is entering his first season as Detroit’s coach, but Ansah didn’t sound too concerned about changes in the defensive system. Ansah has 44 sacks through five seasons. He had a career-high 14 1/2 in 2015 before slipping to only two sacks the following season. He then rebounded with a dozen sacks in 2017. Detroit drafted Ansah No. 5 overall in 2013 out of BYU. It remains to be seen how much longer he’ll be with the Lions, and he wouldn’t say how close the sides were to reaching a long-term deal. “This is, like, over with. I’m just happy to be here. That’s what’s most important,” he said.